12 Do you preview your edits before you save them? I don't plan to address kindness. I do plan to address that JDAM was searchable, a trivial thing to check before creating an article. I will address that my sources were not incorrect, but I mistyped the name and didn't catch it. When you write "unmanned ariel vehicle", you are in no position to claim inaccuracy. Nonsense. A JDAM has aerodynamic guidance surfaces called strakes, which are clearly visible in red in the picture on this page. There might be the start of mounts, but it appears to be a plain, ordinary Mark 84 dumb bomb. It could become a JDAM if the JDAM kit was installed, but the JDAM strakes are not installed. Why are you saying "The photo clearly shows a JDAM" when no JDAM-specific components are visible? Military Editor Ruling: it is NOT a working JDAM in the picture. End of discussion, unless your hubby becomes a CZ military editor. I quote your original notes: "2000-pound GBU-10 laser guided bomb through the hangar bay of the aircraft carrier USS Theodore R) |author = By U.S. Navy photo by Aboard USS Theodore Roosevelt (Oct. 17, 2001) -- An Aviation Ordnanceman pushes a 2000-pound GBU-10 laser guided bomb " A GBU-10 is a laser-guided bomb, a JDAM, but the bomb in the picture does not have a LGB guidance kit attached. Here is the similar GBU-24. The GBU-10 guidance unit is shorter, but still the long protrusion on the nose of the bomb.
. Look at your picture: there is no nose projection; the whitish tip is simply a cap for the fuze well. It's possible that the light-colored sections in the middle of the bomb are packing/lifting, or possible KMU- series mounts for the strakes, but even if they are part of the KMU, the picture is not showing a complete JDAM. Any good picture of a JDAM also shows the Tail Actuator Subsystem, which actually does the steering. The picture I provided shows both strakes and TAS. Some information, mostly on configuration, from Mary's version could be used. Most, however, was simply cut and paste. Much of this could have been prevented with a talk page note on the incorrectly titled article, and perhaps a day of waiting. I am unclear what is meant by "my clear explanation of the differences between bombs". Which bombs? If the reference is to "smart" and "dumb", the correct terminology is precision-guided munition and more specifically guided bomb, as well as, on the less intelligent side, Mark 8x series conventional bombs. I'd be open to renaming that last, since Mark 8x is an Air Force designation, with the Navy variant of BLU series with fire-resistant coatings and insensitive high explosive. Mary, you have told me the same thing three or four times. There is no way to merge the articles. You have to do it. I am not sure if you aren't reading what I am writing, or if I am just not able to explain myself well, but I don't think writing it again is going to help. I would suggest you take some time and look through the article's history. I don't need any more explanations as I understand what you are saying. If you don't understand me, how about using the email feature and I will try to explain further. Otherwise, this article is still available for editing. The Joint Direct Attack Munition is a guidance kit used to make dumb bombs smart. A smart bomb is one that can find its target in spite of its release errors while the dumb bomb is a free-fall weapon meaning it hits the target without any guidance. The JDAM coverts dumb bombs by using a smart tail section which has an intertial navigational system (INS) and a global positioning system (GPS) thereby improving accuracy in all weather conditions. The JDAM can be used by every Navy fighter-attack aircraft such as the Harrier (AV-8B), the F/A-18 (Hornet or Super Hornet) and the F-14 (Tomcat). The Air Force also uses the JDAM. The Air Force uses the JDAM on the following aircraft: B-1B, B-2A, B-52H, F-15E, F/A-22. The JDAM can also be used with Unmanned Ariel Vehicles (UAVs). It is a joint program between the United States Air Force and United States Navy.
" dumb bombs smart. A smart bomb is one that can find its target in spite of its release errors while the dumb bomb is a free-fall weapon meaning it hits the target without any guidance." As I mentioned above on the talk page, there is specific nomenclature in use. guided bomb and, in some cases, precision-guided munition, not "smart bomb"
Mark 8x series conventional bomb, not "dumb bomb"
"The JDAM can be used by every Navy..." This is directly from the Navy data sheet, and is out of date and misleading. F-14 Tomcat aircraft have been retired. The greater number of JDAMs dropped are from Air Force aircraft, simply because there are more of them; the Royal Air Force and other militares use them. It would be most correct to say it can be used on any aircraft, obviously with drop testing, that supports the MIL-STD-1760 and MIL-STD-1553 interfaces. Even for the Navy aircraft, the names were not internally wikilinked. First, Mary, it is an Military Editor responsibility to determine what clear writing may be. Second, we have established terminology in CZ articles, and it is not "smart" and "dumb". Please make a point of wikilinking to existing articles, such as precision-guided munition, gravity bomb, guided bomb, etc. If you have a problem with the terminology of those articles, so indicate on their talk pages. If you do so, give authoritative citations for the alternate usage of the terms. I removed things that you added that did not add information to the article, and, in my opinion, were awkwardly or incorrectly phrased. Turn this around: what is incorrect about the text in the preexisting article, admittedly improperly named? Why should it be replaced? I make an Editor Ruling that "smart" and "dumb" are not the principal CZ terms for these concepts and need not and should not be explained in each article. The term is not "free-fall" bomb but gravity bomb; this reflects Joint Chiefs of Staff and other U.S. military definitions. It is misleading to call these free-fall; perhaps this could be expanded in gravity bomb -- although not all unguided bombs are purely controlled by gravity. 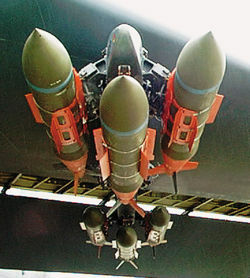 Since JDAM strakes produce aerodynamic lift, not only stabilization, a basic JDAM has some similarity to a glide bomb. Indeed, variants such as the GBU-39 Small Diameter Bomb have gliding wings but still principally use JDAM guidance. Mark 8x series conventional bombs are not free-falling when equipped with aerodynamic retarding devices that allow the delivery aircraft to escape the explosion when dropping bombs at low altitude. Early retarders were pop-out fins that acted as speed brakes, although the current approach is to use "ballute" drag parachutes. Other bombs, released at high altitude, may also use parachutes for stabilization, especially if they have poor aerodynamic characteristics, such as early nuclear weapons or exceptionally large blast bombs. Napalm and related canisters built from fuel tanks are unstabilized, and tumble due to aerodynamic effects. This was considered desirable, because the bomb would hit the ground with considerable horizontal velocity, scattering the burning incendiary in a straight line. I don't really care what Boeing says in its public relations material, if it oversimplifies. We do not accept Wikipedia as a source. Please see Editorial Council Regulation R-2011-12]. It is the responsibility of an Editor to define the level, style, etc. of an article. I have repeatedly tried to guide this article to what I consider an appropriate level, and you inform me that you know better what Citizendium's goals and styles should be. Take the example case of not dumbing down, and the example of ceiling (weapon). I made the definition a wikilink rather than putting it inline, but then expanded on the concept for the more knowledgeable reader. You cited a Navy fact sheet that put it at 45,000 feet, where the reality is that there is a strong effort, especially with the F-22, to exploit dropping at higher ceiling. Is there a problem in understanding the Editor role based on the Regulation I cited? I did not say that the Navy or Boeing were inherently bad sources, but I did say that some of their news releases, especially those that are clearly out of date or dumbed down, are inappropriate sources. I am giving guidance that should be usable. Please use it. I do not really enjoy correcting things that are imprecise. As far as regurgitating, I have been explaining the significance of information, often in my own words since I am familiar with the detailed reasoning. In this talk page, I repeatedly have explained my reasoning on terminology, such as free-fall not being synonymous with dumb. You have come back saying sources say otherwise -- although I don't see them being explicit when I check them -- but you do not directly respond to my explanations. If one were expert, one could deal personally with the explanation, not simply appeal to authority. If you feel some terms need defining, create articles for them and wikilink to them. As you frequently point out, this is a wiki -- and wiki software allows and encourages linking. Defining every basic term inline is not good web writing. Before adding graphics, think about the information they will add; we don't need things that are eye candy alone. When I have selected pictures, I make sure that they show some distinctive features of the subject. For example, the aerodynamic and control features of JDAMs in general are visible from a side or rear view, unless it is a 500 pound bomb that has the strakes on the nose. The front view of the GBU-51 laser JDAM does show the laser seeker, where there would simply be a fuze well on a conventional bomb. An image to which I objected was dramatic in that it was a "panned" photograph with creative blur, but did not show many details, and, as far as I could see, part of the JDAM kit had not yet been attached (the top connectors). There was also confusion on the cutline that initially called it a GBU-10, which is a laser guided bomb, not a JDAM. Actually, the GBU-51 picture shows an Air Force ordie at work; while my family had more naval aviators than members of the United States Air Farce, I don't discriminate (I'm very proud of an inlaw, BG Noel Parrish, the trainer of the Tuskegee Airmen). My mother, in WWII, ran the aviation maintenance school at Pensacola, and my former father-in-law was a Navy test pilot. Some of their stories do not necessarily suggest that the Navvy was Prefect. The United States Navy seemed not to know how to defend Pearl Harbor or to insist on crew protection for the USS Pueblo or USS Liberty, or prevent catastrophic accident-caused carrier fires on the USS Oriskany, USS Bennington, or USS Forrestal, and many other things. I'm proud of the Navy, but I do not assume that a Navy document can be without errors -- after all, I've written a few, variously for SPAWAR, the Office of Naval Research, and the Naval Computer Systems Support Activity. Editor ruling: A source is not unchallengeable merely because it comes from a government source. And you also have the right to have your writing reverted by Editors, who are ultimately responsible for consistent treatment of subjects and style in articles. Again, you are arguing policy, in a manner that appears to defy the stated Editor responsibilities passed by the EC. The EC did not endorse anarchy in writing; it has long been CZ policy that a role of Editors is to put an end to otherwise endless back-and-forth. I've provided a definition, which certainly could be expanded. Remember, if one is a subject matter expert at CZ, there doesn't always have to be a specific source. Nevertheless, in Joint Publication 3-60, the Joint Chiefs of Staff define it as "Unintentional or incidental injury or damage to persons or objects that would not be lawful military targets in the circumstances ruling at the time. Such damage is not unlawful so long as it is not excessive in light of the overall military advantage anticipated from the attack." Note the full designation, and how I completed the reference -- I do need to change "conference" to "publisher". But this fuze is not only used on JDAMs, but on other ordnance--you've described how it would work on a plain Mark 84. What additional information does this provide, to the reader, about a JDAM? Remember, a JDAM is an extension to a dumb bomb and the dumb bomb retains all of its original explosive characteristics. Does the JDAM kit integrate it with MIL-STD-1760 or MIL-STD-1553? So far, you've only described what the fuze does with any bomb. For that matter, are you sure that all JDAM bomb configuration use it, or could any use a FMU-143? What's the role of the FMU-152? Should the reader know? Why are you trying to contact a Constable? This is a content issue under the scope of the Military Workgroup. I am a Military Workgroup Editor. It is not, Mary, your decision, or that of a Constable, what content goes into an article. It is not, under the Editorial Council decision I cited, your decision as to whether material is clear or not. If there is a need to distinguish between "smart" and "dumb", such a distinction, I rule, belongs in guided bomb or precision-guided munition. JDAMs are only one kind of guided bomb, so it makes little sense to make the discussion here. ...used by United States Air Force and United States Navy to enhance the precision of conventional bombs. It converts unguided (so-called "dumb") bombs into guided ("smart") bombs whose drop and target coordinates are set immediately before they are dropped from the aircraft. No. For a preplanned drop mission, they are set well before drop. With a GBU-54 and the upcoming GBU-53, the coordinates can be adjusted in flight. The guidance kit consists of movable tail fins, which attach to a variety of standard Mark 8x bombs. No. For Air Force weapons, Mark 8x, but hard-target penetrators for all services, as well as Navy variants of the 8x, BLU- series that use insensitive high explosives. As mentioned later in the article, the JDAM kit had considerably more than tail fins: the navigationals sensors and the control computer, fin actuators, strakes and hardbacks, and the MIL-STD-1553 and MIL-STD-1760 interfaces. Some of the newer JDAMs, such as the GBU-39 and the BLU-126/B, are not derived from Mark 8x but use JDAM guidance with specialized explosives. Initially the navigational system was based on inertia (INS) only, but newer models also use GPS and laser guidance. Part of the problem is that the lead has been changed so often that it's hard to keep track. At least in American English, "so-called" has a distinctly negative implication, suggesting the term is inappropriate or not true. Do you preview your edits before you save them? [space here]The Joint Direct Attack Munition, usually abbreviated to JDAM, is an add-on used by United States Air Force and United States Navy to enhance the precision of conventional bombs. It converts unguided (so-called "dumb") bombs into guided ("smart") bombs whose drop and target coordinates are set immediately before they are dropped from the aircraft. The guidance kit consists of movable tail fins, which attach to a variety of standard Mark 8x bombs. Initially the navigational system was based on inertia (INS) only, but newer models also use GPS and laser guidance. In the 2003 Iraq War, the majority of bombs dropped by the U.S. were JDAMs. Pure unguided gravity bombs are used less and less. The Joint Direct Attack Munition, usually abbreviated to JDAM, is an add-on used by United States Air Force and United States Navy to enhance the precision of conventional bombs. It converts unguided (so-called "dumb") bombs into guided ("smart") bombs whose drop and target coordinates are set immediately before they are dropped from the aircraft. The guidance kit consists of movable tail fins, which attach to a variety of standard Mark 8x bombs. Initially the navigational system was based on inertia (INS) only, but newer models also use GPS and laser guidance. In the 2003 Iraq War, the majority of bombs dropped by the U.S. were JDAMs. Pure unguided gravity bombs are used less and less. Both for increased accuracy and to deal with moving targets, a prototype terminal guidance seeker was evaluated in 1997-1998. Called DAMASK (Direct Attack Munitions Affordable Seeker), it used IIR (Imaging Infrared) seeker and associated control algorithms to improve the circular error probability to 3m (10 ft). Terminal guidance, however, was abandoned until 2006, with a competition, by the Air Force and Navy, for a Dual Mode Guided Bomb (DMGB) program, which was won by Boeing's LJDAM that Precision Laser Guidance Set (PLGS) to JDAM guided bombs. The other two contenders were Lockheed Martin's DMGB and Raytheon's Enhanced Paveway II (EGBU). Inertial and GPS guidance still gets the JDAM to the target area (i.e., midcourse guidance), but it then follows a laser designator spot onto a potentially moving target. Where is it said that informal writing is precluded at Citizendium? There are many people who will discuss "most correct", but they typically source it to recognized style guides. Alternatively, there is a logical analysis of the expression. Now, I am quite careful about not using "won" to refer to awards for valor; the Medal of Honor is not a contest. In point of fact, however, competitive procurement is just that -- a contest. Typically, competitive bidding is zero-sum; one competitor takes all the award and the others go home hungry. In terms of the competitive process, I would argue that "win" is actually more correct than "award", but "award" is more correct for the contractual phase. ↑ Boeing: Joint Direct Attack Munition (JDAM) Home. Retrieved on 2011-02-15. ↑ JDAM: A GPS-INS Add-on Adds Accuracy to Airstrikes. This page was last modified 06:06, 26 February 2011.